Belladonna (Ital., literally, beautiful lady), a name given to several different plants, as to the atriplex hortensis, amaryllis belladonna, and the atropa belladonna. The amaryllis is a lily of great beauty and blushing appearance. It grows wild at the Cape of Good Hope, and is well known in cultivated gardens in England and France. The name is also in common use for the medicinal extract of the atropa, and in the pharmacopoeias for the root and leaves of that plant, from which the extract is obtained. This is a plant of the solanacem family, known by the common name of deadly nightshade. In England, Germany, and northern France it is met with in shady places along the sides of the walls, flowering in June and July, and ripening its fruit in September. In America it is successfully cultivated in gardens. It grows from three to four feet in height, with straight and strong stems. The leaves, of oval shape and pointed, are in pairs of unequal size; the flowers are large, bell-shaped, and of a dull violet-brown color. The fruit resembles a cherry, for which it is sometimes mistaken by children, with fatal consequences; it contains numerous seeds, and yields a violet-colored juice of sweetish taste. All parts of the plant are highly poisonous. The leaves are most usually employed for the extraction of the alkaloid principle, though the root and berries also yield it to alcohol and water. (See Atropia.) Extracts and tinctures of belladonna are used in medicine, as well as the alkaloid. The latter should be used with great caution, on account of its extreme activity; but it is preferable to the other preparations (which vary materially in strength), on account of the greater precision with which the dose may be determined. It is very rapidly absorbed either from the stomach or when administered subcutaneously. It is eliminated by the urine. One of the most characteristic effects of atropia is the dilatation of the pupil, which may take place from 1/100 of a grain or a corresponding amount of extract of belladonna. The accommodation of the eye is also paralyzed by it. An eye under its influence is able to see at a distance with perfect distinctness, but near vision, like reading, for instance, is difficult or impossible. A peculiar dryness of the fauces and tongue, and a marked acceleration of the pulse, result from moderate doses, 1/80 to 1/20 gr. When larger doses are taken, delirium, usually of a cheerful or whimsical character, and sometimes drowsiness, are added. A certain amount of diuresis, masked by a temporary retention of urine, moisture of the skin, and in rare cases a scarlet efflorescence, are further symptoms. When a poisonous dose has been given, these symptoms increase, and death takes place, with feeble pulse, subsultus, coma or delirium, and sometimes convulsions. It is somewhat remarkable that rabbits are hardly at all susceptible to the action of belladonna. It is sometimes used medicinally in some spasmodic nervous affections, as epilepsy and chorea; for the relief of pain either of the visceral or cutaneous nerves; in cases of habitual constipation and of incontinence of urine; and to check certain secretions, especially of the mammary glands, and to prevent suppuration. Its power for the latter purpose cannot be regarded as fully proved. As an anodyne it is inferior to opium. The claims made in its behalf as a preventive of scarlet fever have not been sustained by proof. In ophthalmic surgery it finds, when locally applied, extensive use in dilating the pupil. - In poisoning by belladonna, after emptying the stomach, tannic acid, or iodine dissolved in water with iodide of potassium, may be used to render comparatively inert any remaining portion of the alkaloid. The caustic alkalies decompose atropia, but only after a few hours' interval; so that, although they should not be prescribed with it, they cannot be relied upon as antidotes. The antagonism between the physiological effects of belladonna and opium exists only in regard to a portion of the symptoms, and those not the most important; but the question as to the efficacy of each as an antidote to the other in cases of poisoning cannot be regarded as definitely settled. 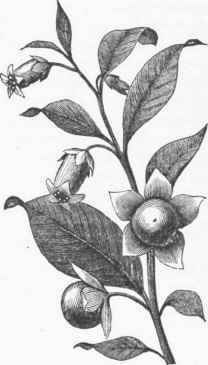 In therapeutic doses belladonna may be used with opium to avoid some of the unpleasant after effects of the latter drug.